Does there exist an adapter that would allow lenses having the so-called 'Beaulieu mount' (viz., lenses made for the 6008, 7008, and 9008 series cameras) to be used on cameras having a C-mount? No, there has not been an official adapter from Beaulieu breech-lock mount to screw-in C-Mount. I am unaware of an unofficial third party adapter so far, but would be happy to be proven wrong. For any of the two Schneider Beaulieu-Optivaron 1:1,4 / 6-70mm or Angénieux 1:1,4 / 6-90mm lenses this concerns – either with Beaulieu LensControlUnit or Beaulieu LensControlUnit II – you would have to physically alter the mounting on the lens. This may prove to be too expensive to be worthwhile. After all, the Schneider Beaulieu-Optivaron 1:1,4 / 6-70mm was also available with regular C-Mount coming with the Beaulieu Reglomatic tubes common on the 2/4008 and 5008-series. If you want to use that lens specifically, this variant would be your alternative package to buy. The Angénieux 1:1,4 / 6-90mm is simply too front-heavy for the few screw-in turns of the C-Mount to hold it without added support systems. To mount those, you need the tripod support wedge accessory due to the non-horizontal base plate of the 6/7/9008-bodies, adding even more weight and unwieldiness to the camera. If you absolutely need that kind of focal range in a vario lens, try scouting for the Angénieux f/1,2 | T/1,4-2,1 / 6-80mm (C-Mount), which has superior resolution and build quality. One is not so interesting but the other is :) with its 180mm max. As a third possibly there was a Cinegon too with LCU ? One might attempt to fix a C-mount camera with a borrowed 6/7/9000 chromium mounting flange. 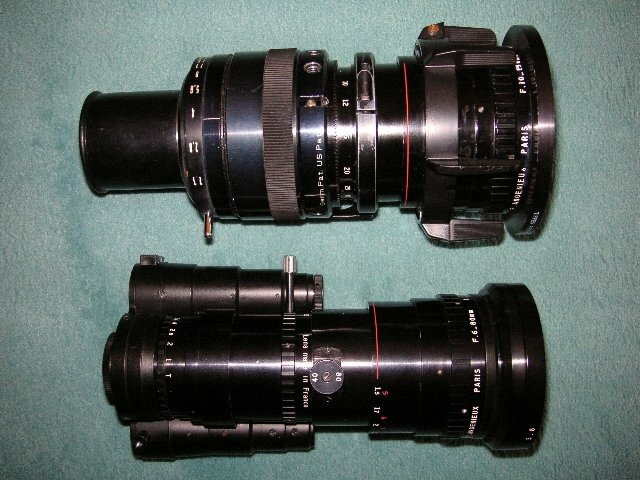 The trouble is that the 6/7/9008 lenses cannot go in deep enough on a 4008 for example. There will never be a sharp image. Although I haven't measured it. To adapt such lenses you would need to replace the chromed tail part with a C-threaded tube to hang the camera from :) while the lens is in tripod-cradle. Too bad a Leicina Special is too deep too. The filmplane is way too far away. Given the rarity of the Schneider Beaulieu-Variogon 1:1,8 / 6-180mm, you could well consider altering the flange tube to a C-Mount screw-wind threaded cylinder. It is technically possible, but you will loose the LensControlUnit due to the resulting protrusion of the case at the rear. That's a problem not existing with the Beaulieu Reglomatic or Leitz Leicinamatic on C-Mount. I had a former film club colleague from Germany who had his Schneider 30x6mm modified for ornithological documentary filmmaking. That's the only use case I can see where such monster zoom with inherent resolving power degradation makes sense, despite Schott Optics best effort to provide selected glass for the prototypes. He had it also retrofitted with the Beaulieu Reglomatic from his Angénieux 13x6mm, and adjusted to connect to the electrical contacts on his Beaulieu 4008 ZM II. In hindsight, some Ritter customers had more money than sense, but ballsy devotion to their gear ;) . Today, one could argue that the resale value of such a mod, should you go forward with it, would be increased significantly. However, it's really up to the budget and nerves you have, and to find an optical engineer who would do that kind of work. Please bear in mind what I said about the Angénieux 15x6mm, with its weight and chunkiness not fit for the C-Mount, though. From the few times I handled one, I recall the Schneider 30x6mm to be even more chunky, and very heavy. The C-Mount in pre-6/7/9008-series Beaulieu models is simply not ankered solidly enough into the body to support such a weight. This goes well into Normal / Super 16 lens territory already, and a totally different class of required mounts. I guess the simplest way forward would be to bite the bullet and buy a Beaulieu 6/7/9008 Pro model, ideally with fitted ground glass and secondary trigger control (as I presume you would be shooting mostly from tripods with a support system). Apart from the Beaulieu 6-70mm and Angénieux 15x6mm, plus the few prototype Schneider 30x6mm that escaped into the wild, and the rightly-forgotten entry-level Beaulieu-Zoom Macro 1:1,4 / 6,9-55mm, I don't know any other lens with either LCU or LCU II. Neither the Schneider or the Leitz Cinegon 1:1,8 / 10mm came with any servo units. Are you talking about the Schneider 1:1,4 / 16mm Cinegon? I am curious. Bear in mind what I said about the Angénieux 15x6mm, the weight and chunkiness not fit for the C-Mount, though. The Schneider 30x6mm is even more chunky, very heavy, and the C-Mount in pre-6/7/9008-series Beaulieu models is simply not ankered solidly enough to support such a weight. There was a reason why the Beaulieu Mount was introduced. The simplest way would be to bite the bullet and buy a Beaulieu 6/7/9008 Pro model, ideally with fitted ground glass and secondary trigger control (as shooting mostly from tripod). Is Ritter still in business? If not, maybe Björn Andersson could make such a modification. I've got a rod support system for my 4008 series cameras (an article describing it was published in issue #15 of Super 8 Today), so the weight of the lens isn't a concern. On the other hand, since the practical applications of the 6-180mm lens will be limited, your last recommendation might be the most sensible course. Ritter Film + Videotechnik in the form of being Beaulieu's German general distributor and "keeping it all alive" after Beaulieu itself went bust, well, THAT company and its technicians are no longer in business for over a decade. Wittner took over the stock and parts and Beaulieu representation, but not the former caliber of repair and maintenance services offered. I understand, though, that Ritter has been re-established, and they do offer some repair services. I am unclear if whoever is their tech guy now would take on such a project. After all, the mod I am talking about was done in the 1980s. Having been a long-term customer with the original Ritter company, I must admit I didn't regret too much when they went bust and stuff moved to Wittner. I have done all my Beaulieu business with Björn Andersson from the 2000s on, so I really can't comment on this reborn Ritter company. But check them out, and feel free to post here about how things progress. This is a really interesting topic and potential project. If you will have a modification on a Schneider 1,4/6-70 lens without C-tread its possibly for me to change the rear end for LCU to a C-mount tread. I was just wondering about the Super-8 10mm. I have never seen one with motorized control. benefit from electronic exposure control. The tube and rings are much smaller and I can believe it would be difficult to make a standard LCU interlock with gear-rings on the lens if there were any. Not to start how to make the two conjoined. The easy way to use the lens would be with a fitting body from the 6/7/9009 models. A proper groundglass would indeed be handy. Mind where the pin is on your lens as it must go in the hole which in different places for the 6008 and the 7/9008. Fitting a 6/7/9008 receiver on a 4008 would be nice if distances would allow it. The mirror in a 4008 is very close to the C-thread tube. 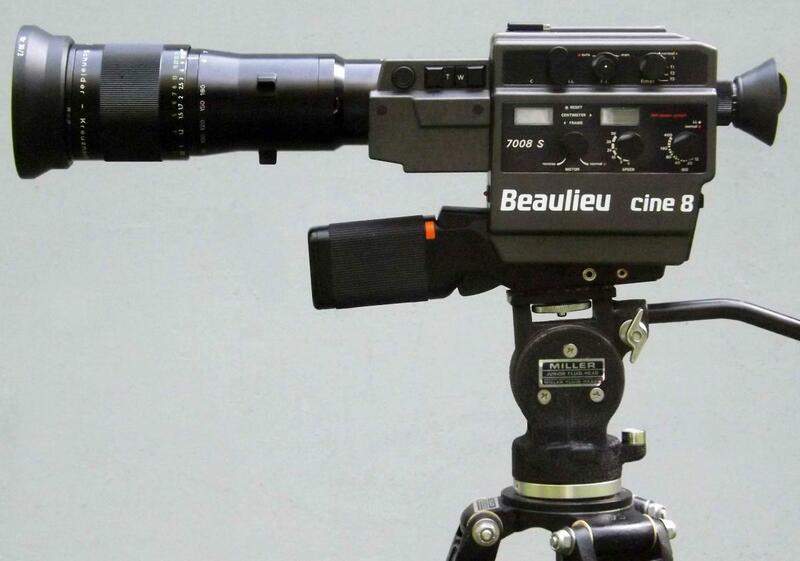 Beaulieu have made set for a Iscorama with a Schneider 10mm lens and a LCU for 6/7008. That is great to know, thank you Bjorn! I only knew from attached 1979 snipped cut out from an Objektiv magazine that there was a Schneider Iscorama-Cinegon 1:1,8 / 10mm with one Beaulieu Reglomatic servo tube available for the Beaulieu 5008 S. Cool that it was also continued with LCU for 6/7/9008-series. How are things progressing with finding a camera to fit this special lens? No luck so far. Especially as it took years to find the lens, I'm in no particular hurry. What would be the purpose of this straight cylinder of glass at the rear? Could this be adapted to shorter length to fit it to other cameras with more distance from the film? Like the Leicina Special M-mount? I chose to not modify the lens and finally found a Beaulieu 7008 S camera in perfect condition on which to mount it. All that's needed now is some fresh-from-the-factory Ektachrome 100D. Thanks for the update, don't hold your breath while waiting for E100D or what they are working on. Well, we got Ektachrome! I'm sure along with many other forum members, would love to see some pics of this rarity mounted on your 7008S Glenn! Todd, I've sent you a PM. Glenn Brady was kind enough to send me a photo of this rare beast the Schneider 6-180mm Variogon for the Beaulieu 6/7/9008 series of cameras. I've included part of Glenn's email below about contacting Schneider about his particular lens. In March 2017 I contacted Schneider in Germany to learn more about the lens and got the following response: "According to the serial number your lens was produced in 1976. Unfortunately, we have no further information." 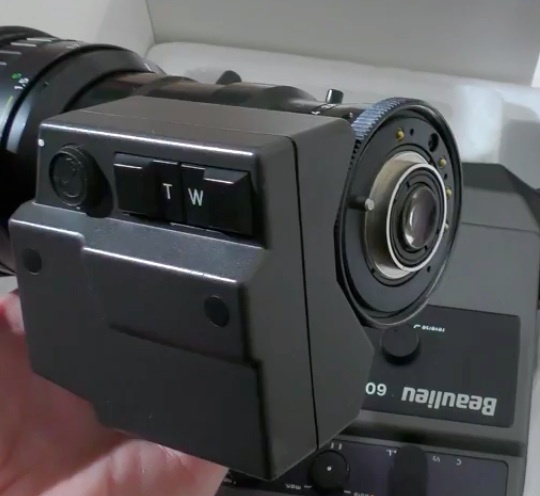 Michael Lehnert, who seems knowledgeable about all things Super 8 generally, wrote of this lens in 2013, ". . . there were only a few prototypes made for the Photokina fair that dubiously found their way into private hands". As far as I know, this lens won't fit Beaulieu 6008 series cameras because its index pin is at the six o'clock position. It should be compatible with all 7008 and 9008 series cameras. And what does Lehnert know about "dubiously found their way" of 40 years ago. It is just slander. Certainly, you couldn't just take them home after the event. In the end, they were possibly offered to people who would have good use for them. Were 7008 Beaulieu available in 1976? Did someone move the pin later from 6008 to 7008 position? This is Cinematography.com, not a Facebook group or Twitter tirade. As a moderator of this forum, I very kindly request you moderate your language to maintain the professional tone everyone upholds here. Also, defamation is a specific offence, especially under the Netherlands' Civil Code. Can I suggest you read up on the difference between slander and libel, because you use the words incorrectly. The history of the few Schneider 30x6mm is no secret. After market testing at Photokina, Schneider decided for good and pretty obvious reasons not to move beyond their prototype or pre-series run of this lens. Some of the specimens, either from Schneider or Beaulieu distributors who actually showcased them on their own Photokina stands in parallel found their way into private hands over the years. One I know was modified for a specific filmmaker for specific film projects which were shown at closed-door club events. These were mostly nature documentaries, an application where this lens made sense. This is all discussed in this thread and other threads here. Also in print in the German-language BeaulieuMagica magazine of the 1990s. I only know the current whereabouts of 2 lenses, one in Germany, one in Switzerland. They are not for sale. One was in active use, the other forms part of a private collection. As time goes by, they will inevitably become part of an inheritance or bequest. Possibly the opening in the mask was too small and got clogged?